PORTSMOUTH, NH – Scallopers should be able to land roughly the same amount of product this year as last, but they’ll be harvesting a larger percentage of the catch in open areas rather than access areas. The New England Fishery Management Council agreed to this strategy on Jan. 29 when it finalized Framework Adjustment 25 to the federal scallop plan, which contains 2014 fishing year specifications. “We’re all going into this with our eyes wide open, but we think this is going to work out,” said John Quinn of Massachusetts, a member of the council’s scallop committee. Scallop biomass overall is fairly high right now, and last summer’s surveys turned up welcome evidence of strong recruitment in the Mid-Atlantic and potentially around Nantucket Lightship. The problem is that much of the biomass is below harvestable size and needs another year or two to grow out (see CFN November 2013). The situation has been frustrating for fishermen, who had become accustomed to annual 50-million-pound-plus landings and enjoying the benefits of a steady-eddy fishery. 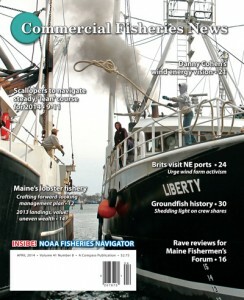 Read the rest and much, much more in the April issue of Commercial Fisheries News.